Right from the get-go, when the French first colonised New France (what is now Quebec), they created a rowdy tradition of getting together just before Lent to eat, drink and be merry. The custom of celebrating sometime around mid-February has long been popular. 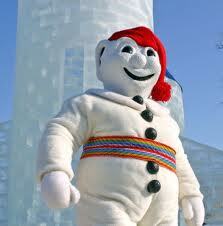 The first officially recognised large winter Carnival in Québec City, however, took place in 1894. Often faced with winter’s hardships, the city's population reinvented the popular tradition of carnival brought from France with a winter celebration that celebrates exactly that - winter. In 1954, in the context of the economic development of Québec City, a group of business people started to commercialise the festivities. That year, Bonhomme (to the right) was born and elected the event’s representative. The first official edition of the Québec Winter Carnival took place the following year, in 1955. Since then, the Carnival has snowballed into an undeniable manifestation for the entire Québec City population, having become an important vehicle for tourism and economical activity in the city. As well, from one winter to the next, the Carnival has enriched its activity program, having added a number of more popular activities that includes winter sports, snow sculptures, and activities based on the traditional Québec lifestyle, such as canoe races and dogsled races. 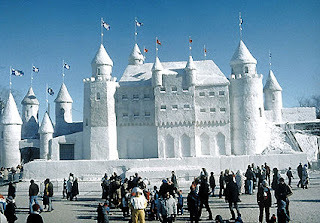 Check out the Ice Palace put up every year below. Today the Québec Winter Carnival is the largest winter carnival in the world, and is third on the list of top carnivals worldwide, after the famous carnivals in Rio and New Orleans. Ok, now we know that this blog is all about Canadians in Portugal, where these two countries coexist as much as possible. 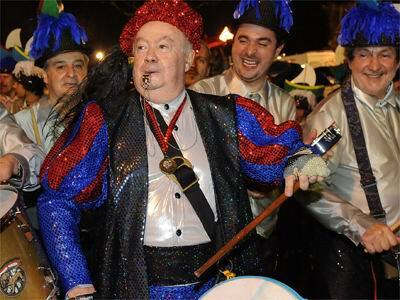 That said ... the Portuguese Carnival. First off, it's worth pointing out that the Portuguese carnivals of yesteryear were not exactly like todays, as missing were the scantily clad dancing girls a la the Brazilian Carnival (we must not forget that at the time of the Carnival in Brazil, it's summer, not exactly the same here, brrrr...). 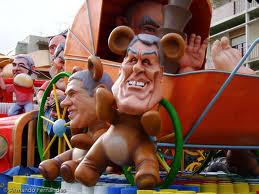 Yes images like the one below are typical to Ovar, Torres Vedras, Loulé and many other carnival-loving Portuguese towns. The traditional Portuguese Carnival is more about people getting dressed up, often with masks, and making fun of each other and playing tricks on each other. It's also all about mocking public figures like what you see on the left below. Yes that's Cavaco Silva, the Portuguese President of the Republic right up front and former Portuguese PM José Socretes in the back as well. Sometimes, however, public figures themselves show-up to even mock themselves. Yes that's Madeira's Alberto João Jardim below on the right. He's a regular at the Carnival in Funchal year in, year out. people are not sufficient to talk on such topics. To the next. be shared around the web. Shame on the search engines for not positioning this post higher! entire thing without having side effect , other people can take a signal.